You may well have rubbed a nose before – the pudgy nose of a loved one perhaps, or maybe the moist nose of a pet dog or rabbit. You might've even been to a wildlife park and inadvertently rubbed the nose of a hungry giraffe as it craned its neck and grabbed the grass from your hand. But there's one nose you probably haven't rubbed (yet). It's a nose in London that used to be rubbed a lot. You'll find it a mere sneeze away from Trafalgar Square, in Admiralty Arch, an exquisite Grade I listed building almost a hundred years old. About seven feet up on the left-hand side of the right arch (coming from Trafalgar Square), you'll see a life-sized schnozzle carved from stone and fixed firmly onto the concrete wall. The story goes that soldiers fighting under the Duke of Wellington (who supposedly had a huge hooter) would rub the nose for good fortune as they rode on horseback (hence seven feet up) through Admiralty Arch. 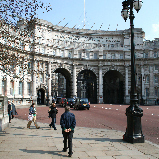 So if you're down on your luck, or are just curious about one of the city's wonderful oddities, run across to Admiralty Arch and see if you can spot the nose. Once you've found it, reach up and give it a little rub. Passers-by may think you're slightly bonkers, but that only means they're yet to discover the wonderful conk that's a comical kink of Admiralty Arch. Where: Admiralty Arch, by Trafalgar Square.